Vladimirs Yakunin and Putin—old friends. The journey of a member of the global super-rich often traverses three main stages, as he (these are pretty much all men) moves from a position of power at home to a life of wealth and luxury abroad. The stages were outlined by writer and journalist Oliver Bullough. In stage one, he gets his money offshore and away from the hands of the home government that might try to seize them. Next, he moves his family out of that government’s reach, most likely to London or Geneva, perhaps New York, and buys property using the offshore wealth. “It’s become widely acknowledged in recent years that the UK is one of the global centers of money laundering,” says Robert Barrington, executive director of anti-corruption NGO Transparency International’s UK branch. “The dirty secret which has not yet been fully revealed,” he says, is how frequently wealthy exiles engage British-based PR agencies, law firms, and others for the purpose of reputation laundering. This is the story of how three British companies were hired by the family of Vladimir Yakunin—a Russian oligarch, former top government official, and old friend of president Vladimir Putin—for the third of these stages to help set up a new life for the family in London. Yakunin has reportedly been friends with Putin since at least the 1990s, when they were members of the same dacha cooperative, and for 10 years ran state-owned behemoth Russian Railways until leaving the job in 2015. Reports at the time suggested he had been fired from the post, but Yakunin, who denies having been a close advisor to Putin, insists he resigned. In March 2014, the US Treasury included Yakunin on its list of Russian officials under sanctions for their involvement in Russia’s annexation of Crimea. 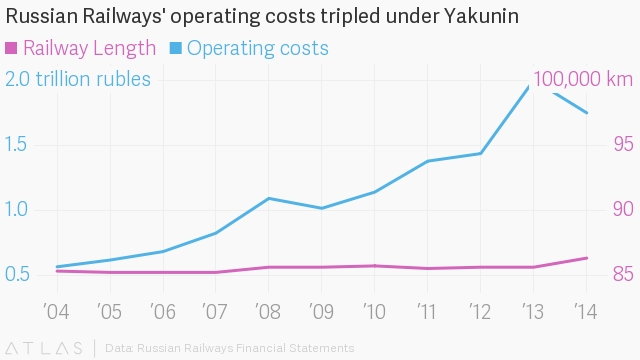 A crucial cog in the economy of the world’s largest country and its biggest employer with around 800,000 workers, Russian Railways’ operating costs more than tripled during Yakunin’s decade at the helm, while the size of its rail network increased just 1.2% (xls). (The extra mileage may be due solely to the addition of Crimea’s rail lines after the Russian annexation). Some reports say freight trains actually got 5% slower between 2004 and 2014, and in Yakunin’s last year the company lost 99 billion rubles (around $1.65 billion at 2017 rates). Russian opposition leader and anti-corruption campaigner Alexey Navalny has alleged these figures are due to “corruption and mismanagement.” By tracing webs of offshore companies he alleges are owned by Yakunin, he accuses the ex-official of accruing billions of dollars and building “a huge business empire registered to offshore companies all over the world.” Yakunin has consistently dismissed the allegations as unfounded. His spokesman, Grigoriy Levchenko, told Quartz in an email they were “completely false” and were politically motivated on Navalny’s part, asserting that Yakunin’s money came from his earlier business career and high salary at Russian Railways. Reuters found in an extensive investigation that Russian Railways paid billions of dollars to private contractors that had hidden ultimate beneficial owners and little or nothing going on at registered headquarters. From 2010 to 2013, 43 contracts worth $340 million were won in competitions where the only bids were made by the same two companies—both of which were set up on the same day and by the same person, acting for undisclosed owners. The former KGB officer’s public image is as a strict Orthodox Christian and a nationalist decrying the influence of the West on Russian culture. Meanwhile, his younger son, Viktor, owns a business in London and says he has dual Russian-Cypriot citizenship, while the older son, Andrey, owns two houses in north London via offshore shell companies worth an estimated £39.5 million. (Andrey Yakunin told Quartz he thinks those valuations may be “a bit on the high side.”) Andrey runs an investment fund with an impressive pedigree in securing deals for hotels right next to railway stations in Russia. His own son, Igor, attended London private school Highgate and, according to a LinkedIn profile in his name, studies medicine at Cambridge University. Based in the heart of London’s legal district at a short hop from the Royal Courts of Justice, corporate intelligence firm GPW + Co. has counted Apple among its clients, and former Conservative cabinet minister Lord Francis Maude as a senior advisor. It says it serves “multinationals, law firms, financial institutions, investors and sovereign and governmental organisations.” Its services include conducting political risk analysis for blue-chip multinationals and helping big Russian banks track down debtors to find out where they’re hiding their money, sources said. Its clients also, however, include émigrés from the former Soviet Union. “[They] come to London and there are professional companies with the skills they can use to either hide their assets or dig dirt on their enemies,” said a source close to GPW. GPW was hired to protect the Yakunin family’s reputation, said sources with an intimate knowledge of the company who didn’t wish to be named for legal reasons. The sources believe the firm stopped working for the family last year. According to these sources the work it did included “asset tracing,” in which GPW, through online services and public databases, tried to track down any assets it could find belonging to the Yakunin family. The aim, one source said, was to provide the Yakunins with information they needed to keep assets hidden from anti-corruption investigators such as Navalny, or to be prepared for whatever such investigations might show. “Then [the Yakunins] can mend the holes and the gaps in their offshores by adding layers of shell companies,” said the source, describing the practice. Andrey Yakunin would tell GPW about allegations Navalny had made or was expected soon to make, according to the source, and ask the firm to check if there was other material Navalny might find. GPW also put together “reverse due-diligence” reports on both Andrey and Vladimir Yakunin, sources close to the firm said, compiling all the negative information available about them from open sources—corporate databases, property records, and online and social media—so they could decide how to deal with any negative information that turned up. GPW helped with other requests by the Yakunins, too. One of these was to provide the home address of a British journalist who had written a negative story about the family. The sources close to the company couldn’t recall where the article was published but said a number of people in GPW felt uncomfortable that the company had complied with the request. A source said the firm also helped vet the executive committee and consultants for Vladimir Yakunin’s Berlin-based think tank Dialogue of Civilizations, checking there was nothing controversial in candidates’ backgrounds. Levchenko, Vladimir Yakunin’s spokesman, declined to comment on a series of questions about GPW’s work, saying, “GPW is not an advisor to [Vladimir] Yakunin.” He repeated that “GPW is NOT an advisor” when asked as a follow-up whether GPW had ever in the past performed services for Yakunin. Nikita Kulachenkov, an investigator at Navalny’s Anti-Corruption Foundation, says it is “sad to hear” the Yakunins can use firms like GPW to work out how to hide assets better, but was pleased to learn they are forced to take these measures. “It shows our investigations worked,” he said. Kulachenkov rejected the Yakunins’ claims that Navalny’s allegations are unfounded, saying the foundation has “proper evidence to every statement that we publish” and only publishes information for which it has two sources. He agreed with Yakunin that Navalny’s investigations are politically motivated, since Navalny is a politician with an anti-corruption platform. “I see nothing wrong here. As long as it serves the public needs—and it definitely serves the public needs in Russia—we do these investigations,” Kulachenkov said. Reportedly a descendant of the Romantic poet William Wordsworth, Andrew Wordsworth spent a lot of time with wealthy Russians and appeared to revel in their company, a source close to GPW said. The source described him in a way that epitomizes the role many of Britain’s educated classes play in 21st century London, providing services for the global super-rich (paywall). “He’s your typical eccentric Englishman—sort of Tinker, Tailor, Soldier, Spy—which Russians obviously love,” the source said. “He always had the talent for getting all those Russian clients because they just thought he was out of a book.” Wordsworth declined to comment on the accuracy of this characterization. Beyond its work for the Yakunin family, GPW found itself in the news last year for reportedly accepting a £50,000 (currently $64,000) contract to work on behalf of Andrey Pavlov, a lawyer who, US prosecutors say (pdf, p.11), worked with a Russian mafia group that carried out an alleged $230 million fraud against the Russian government. Sergei Magnitsky, a lawyer who investigated that alleged fraud case, died in Russian police custody; the country’s human-rights council said there was evidence he had been beaten and tortured. According to a report by the Daily Beast, Pavlov hired Wordsworth and GPW through a leading US law firm to try to keep him off the EU’s Magnitsky List, which aims to deny visas to and freeze the assets of anyone related to the lawyer’s death. So far, the efforts have had mixed success—a non-binding European parliamentary resolution was passed in 2014 asking the European Council to sanction Pavlov and others. While GPW’s job included keeping negative information about the family out of the public eye, the Yakunins employ Mishcon de Reya, one of the UK’s most prestigious law firms, to advise on any potentially damaging news stories that do emerge. The firm represented Princess Diana in her divorce from Prince Charles and led the legal challenge to force Parliament to pass a bill before the government could trigger Brexit. It is expert at using Britain’s notoriously strict libel and privacy laws (the mere threat of a legal claim can sometimes deter journalists from publishing) on behalf of clients. An example of this arose when Roman Borisovich, a UK-based anti-corruption activist, organized a “kleptocracy tour” around London houses that he alleged had been bought with money laundered from abroad. The tour stopped by Eden House in Highgate—reportedly bought by Andrey Yakunin through a Panamanian company for £4.5 million in 2007. Afterwards, some journalists on the tour received letters from Mishcon de Reya, one of which was shown to Quartz. The letter alleged the tour was “an unlawful campaign of harassment” against Andrey Yakunin, accused some participants of breaching his and his family’s privacy by taking photographs of the house, and said the tour raised “real concerns of threat to our client’s security.” Publishing the details of the tour or any allegations it made about the Yakunins “would form part” of the alleged harassment campaign and “perpetuate and significantly aggravate the damage already caused,” the letter said. The tour was nonetheless covered in a number of outlets, but according to Borisovich and Bullough, local north London newspaper Ham&High didn’t have the means to fight Mishcon de Reya. It deleted its story and published an apology to Andrey Yakunin, saying it had agreed to pay his legal costs. The paper was “basically intimidated; it was inexperienced in these matters,” says Borisovich, a former banker who spent over 20 years on Wall Street and in the City of London. Mishcon de Reya declined to comment on this story, and Ham&High didn’t respond to emailed requests for comment. The third prong of the Yakunin family’s reputation strategy is PR firm Project Associates. While GPW and Mishcon de Reya work to limit reputational damage, Project Associates promotes a positive image of Andrey Yakunin, said sources close to GPW. It champions Yakunin as a respected businessman and philanthropist, sources said, arranging public speaking events, interviews with the media, and placements of opinion pieces by him. Yakunin is listed as a donor to the Royal Opera House and has written op-eds on such things as the special nature of UK-Russia relations, though it’s unclear whether Project Associates arranged those activities specifically. One former employee of Project Associates—who did not work on the Yakunin case but, in an office of only about a dozen people, was aware that he was a client—said it seemed to him as if the firm was “trying to help [Andrey Yakunin] publicly disconnect from his dad and improve his public image, so he appears a successful businessman as opposed to the son of a Russian politician or businessman who was a friend of Putin’s.” According to this source, two of the firm’s higher-ups would have weekly breakfasts with Andrey Yakunin. Project Associates, the former employee said, has a history of working for ultra-wealthy people from the former Soviet Union and regimes such as Hungary’s autocratic government. (Positive PR for such governments is so endemic among London PR firms that they have become known as “London launderettes.”) The company’s clients have included Russia’s richest woman, Yelena Baturina, who Russian prosecutors allege gained much of her wealth by winning municipal building contracts (paywall) when her husband Yuri Luzhkov was mayor of Moscow. In a leaked 2010 diplomatic cable, then-US ambassador to Russia John Beyrle described Luzhkov as overseeing a “pyramid” of corruption during his time in office. Baturina and Luzhkov have consistently denied (paywall) these allegations. Like many such firms, Project Associates maintains ties to the British establishment. Listed on its global advisory board are Baroness Catherine Ashton, the European Commission’s former vice president and foreign-affairs chief, and general Sir Mike Jackson, former head of the British Army. Meanwhile, Steve Norris, an ex-government minister and two-time Conservative candidate for the mayorship of London, is a non-executive director. Norris, Ashton, and Jackson did not reply to requests for comment. Project Associates managing director and founder David Rigg said the firm doesn’t comment on “confidential client matters,” but added that the company “does not, never has and never will act for anyone, or any entity, which is under sanctions.” When told that Andrey Yakunin had acknowledged to Quartz that he had hired Project Associates, Rigg said the company deemed him to be far enough removed from the sanctions on his father to work with him. There’s no suggestion that the work of GPW, Mishcon de Reya, or Project Associates with the Yakunin family violated sanctions on Russia, since the firms are based in the UK, while Vladimir Yakunin is sanctioned by the US and Australian governments. Law firms like Mishcon de Reya are subject to money-laundering regulations and would have to undertake due diligence on Andrey Yakunin before taking him on as a client, to ensure his money didn’t come from illegal sources, says Michael Lyons, a specialist in financial and white-collar crime at British law firm Clifford Chance. (Andrey Yakunin himself told Quartz he is a Politically Exposed Person (pdf), someone financial regulators typically consider worthy of greater-than-usual scrutiny.) GPW and Project Associates aren’t subject to those regulations; but, explains Lyons, like every person and business in the UK, under the 2002 Proceeds of Crime Act they can’t be involved with any money that they know or suspect may have criminal origins. None of the firms mentioned in this piece responded to questions about due diligence they undertook on the Yakunin family. On top of doing due diligence and legality checks, business intelligence firms might do a “headline test” on potential clients to see how it would affect their reputation if that client were made public, says Sarah Lain, a fellow at the Royal United Services Institute think tank, who used to work in corporate intelligence. That all depends on that firm’s appetite for risk, however: “Although Andrey Yakunin is not himself sanctioned and does not hold a prominent public function, there would still be political exposure risks from his father,” she says. One important question is how the consultants satisfied themselves they were being paid solely with Andrey Yakunin’s money, not money that came directly from his father or as a consequence of his father’s political connections. Borisovich alleges it is “absolutely not” plausible that you can disentangle Andrey’s money from his father’s. “Andrey Yakunin for years has been running an investment fund that is linked to the family,” he said. Borisovich and Navalny even suggest it’s not a coincidence that one of the funds, VIY Management—which officially stands for Venture Investment and Yield—happens to have the same initials as Vladimir Ivanovich Yakunin. In another odd coincidence, Vladimir Yakunin’s mansion near Moscow is officially owned by a Cypriot shell company, which in turn owns another company that has the exact same address and phone number as VIY Management’s St Petersburg office, according to the investigative-journalism organization OCCRP. The St Petersburg office of VIYM has been run by Andrey’s younger brother Viktor, according to Reuters. In a statement made three years before he departed Russian Railways, Vladimir Yakunin’s office told Reuters that his and VIY Management’s shared initials were indeed coincidental and that “all attempts to extrapolate from this coincidence any kind of affiliation with [Vladimir Yakunin] amount to fiction.” As noted above, Yakunin has also consistently denied allegations that his money was improperly gained. Andrey Yakunin did not directly address the claim that VIYM is a family fund, but said “any suggestion that my father had some improper influence” on his wealth is “baseless, wholly inaccurate, not to mention deeply offensive” to his employees at VIYM.